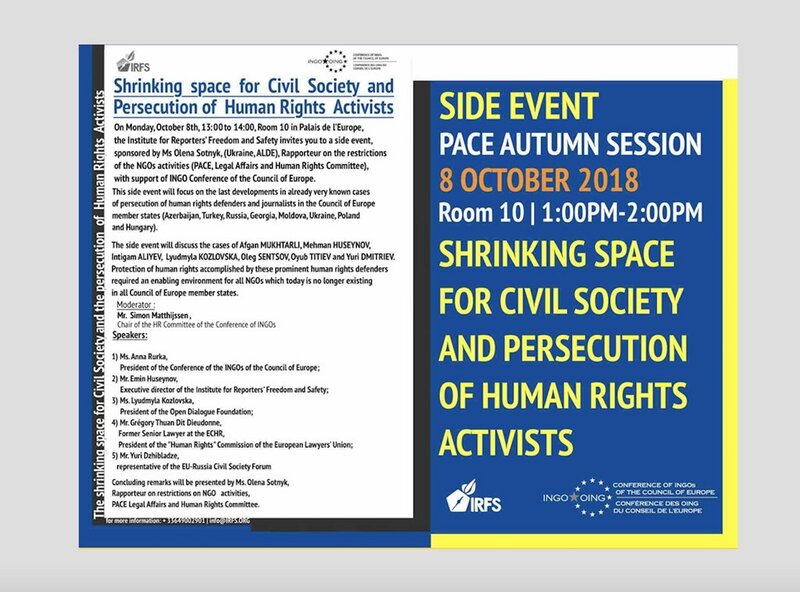 On Monday 8th, Mrs Kozlovska will deliver her contributions at the “The shrinking space for Civil Society and the persecution of Human Rights Activists" event, taking place between 13:15 and 14:15 in Room 10 of the Palais d’Europe. The side-event is organised by the Institute for Reporters’ Freedom and Safety, hosted by Ms Olena Sotnyk, (Ukraine, ALDE), rapporteur on the restrictions of NGOs’ activities (PACE, Legal Affairs and Human Rights Committee), with the support of the INGO Conference of the Council of Europe. On Wednesday 10th, an event entitled “Human rights in danger - the dismantling of the rule of law in Poland" will take place between 13:00 and 14:00 in Room 14. The organiser of this conference, Mr Frank Schwabe (Germany, SOC), has been the first to invite Mrs Kozlovska back into the EU, after the outrageous Schengen entry ban imposed on her by Polish authorities in August 2018. In their appearances, Mrs Kozlovska and the delegation will address both her case, which represents a worrying signal of the weakening rule of law in Poland and the authoritarian trend that holds grip on the country, as well as the cases of human rights defenders and regular citizens who see their civil and human rights constantly violated by authorities in post-Soviet countries such as Kazakhstan, Russia and Moldova.